A native of South Florida, Josh Leskar attended the University of Michigan, where he earned his BA in Sport Management. He wrote feature stories and game recaps as a media relations intern for the Men's Football Team and Men's Ice Hockey Team. For three years, he also played Club Ultimate Frisbee. Upon graduation, Josh took a job with a non-profit in California, and since has been a freelance writer, an educator at La Petite Cuillere - an after-school culinary program for children K-4, a pastry delivery man, and most recently a content marketing manager at Udemy As a second job, he eats and drinks his way around the Bay Area, while also baking a bevy of pastries from his home kitchen. 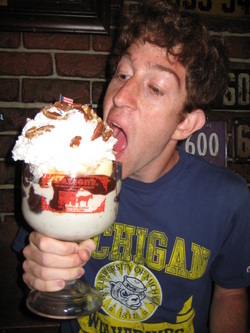 To compensate for the calories, he runs marathons. He is a sucker for a runny yolk and punny joke. He is passionate about the power of food to bring people closer together. By telling the stories of cooks and their dishes, he hopes to bridge the gap between producers and consumers in the industry and showcase the art form that is the culinary experience. Josh is a loving son, brother, and friend. He also wrote his entire bio in the third person.